It was one of those really long, but good days. I want to just curl up and go to bed but I thought I should post about our book today. 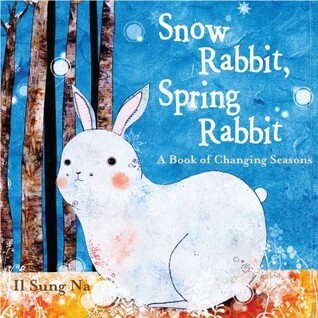 Our next book from the “Kindergarten Ready, Set Go!” calendar was Snow Rabbit, Spring Rabbit: A Book of Changing Seasons by Il Sung Na. I read this book to my Kindergarten class back in March as a diagnostic task for assessing their ability to Make Connections. After studying signs off Fall and our unit on migration in November I wanted to see they could connect with this book and how the different animals know that it is time for winter. After that activity I put in on the shelf but pulled it out today to read to Eileen and my niece who is visiting for a couple of days. Since it is not really a time of year when they can relate to changing seasons, just VERY warm dry weather, I decided to focus on a different aspect of the book. The rabbit in the book know it is time to change the season and changes the colour of it’s coat. We talked about why he might change his colour, and with some prompting we figured out that he might want to be able to hide. In the winter with a white coat, he can hide in the snow but that wouldn’t work very well in the spring so he changes his colour to blend into different surroundings. 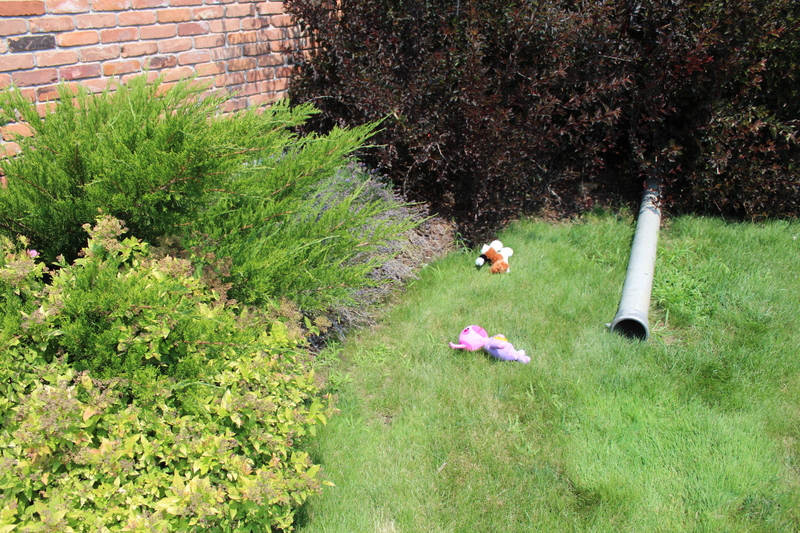 I then sent the girls on a hunt to each find 3 stuffed animals in our ‘stuffy bin’ that they could hide outside. 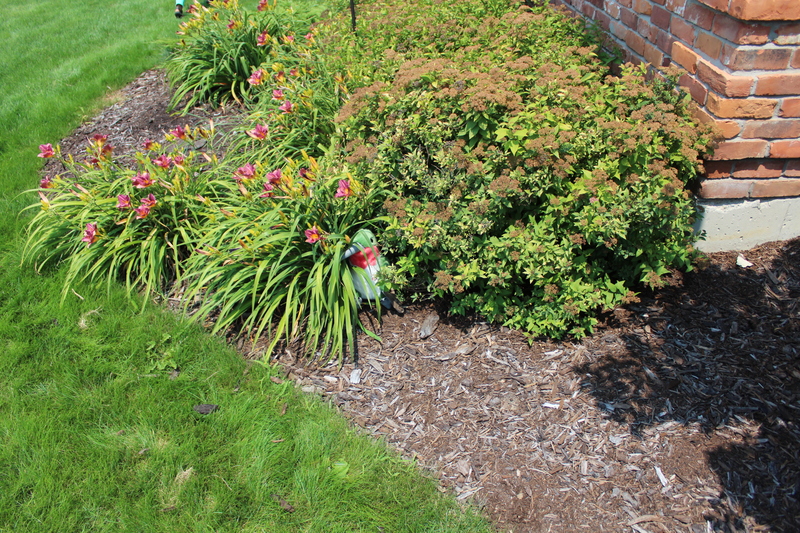 I talked about how we would want them to blend in with their environment. They really didn’t understand this at all but had fun playing find the stuffy. I was glad I picked 2 to hide so that it was bit harder for them to find. They didn’t quite understand the hiding concept and I found them just laying on the grass. It was kind of funny that Lyric hid her first and then Eileen pretty much just went and put them in the same spot. I thought that I hid mine in places a bit more difficult to find but I also was more strategic picking what animals to use. 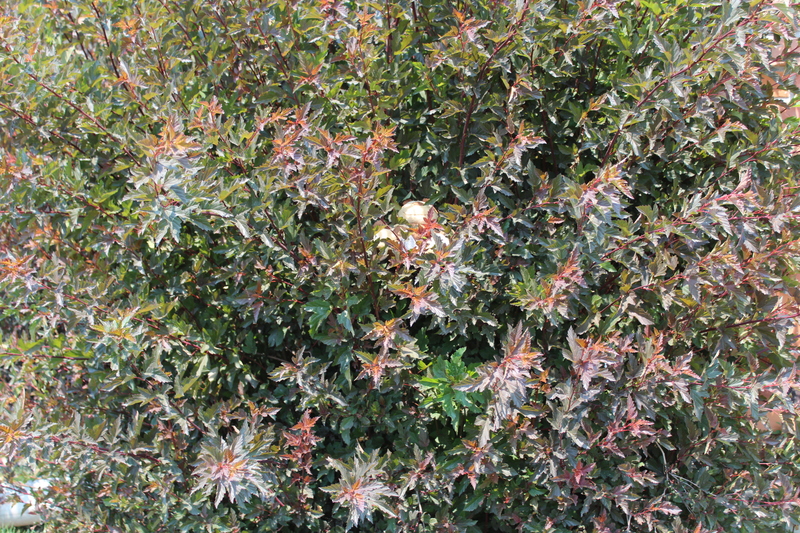 They found the hummingbird pretty easy but needed a lot of guidance to find the brown monkey in the bush – can you find it? Even though the girls didn’t understand the purpose of the game or really understand camouflage at all we had fun. If I was to do this again, after reading the book I would show them some images of real animals and how they use their colours to camouflage. Then I would give them toy animals to hid that they would be able to blend into their environment. For example they may have had more luck with the green turtle. After playing we went on a search for some very special twigs and then took them back in to the air conditioned house. I told them we were going to make our own animals that we would then later hide for Kaitlyn to try and find outside. I got out the goggly eyes, pipe cleaners, white glue and a bit of gold glitter glue. 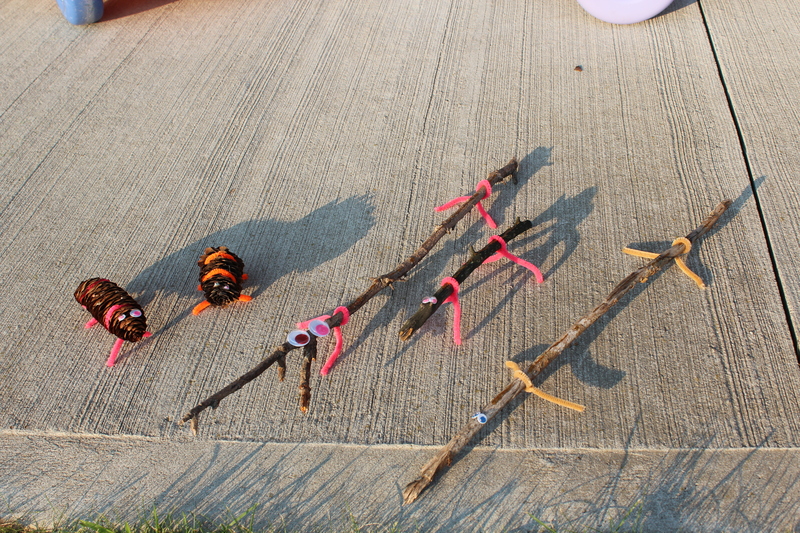 We made our own creatures out of our sticks, and the two pinecones the girls just had to use. I found my inspiration at KinderNature. They are a bit more camouflaged but the urge for the girls to pick bright colours for their legs won out (mine is the one with the brown legs). We didn’t have time to hide them for Kailtyn today but we will make sure we do it sometime this weekend before my nieces go home! When you register for Kindergarten in our school board (Grand Erie District School Board), one of the items in your package is the calendar “Kindergarten: Ready Set Go!” This is a collaboration of a number of organizations included school boards, heath units, libraries and the Ontario Early Years Centre. Throughout the calendar there are pages to help parents prepare their children for Kindergarten. For February the information was on immunization requirements. My children are up to date on their immunizations but tracking them is a pain. In this age of electronics I don’t know why I can’t just authorize my family doctor to send the records to the health unit every time they get a new vaccination. It just seems it would save a lot of time and man power on every end. But I digress from the reason I am blogging. In each month there are 2 or 3 books listed. When Kaitlyn was getting ready for JK we read all the books listed but this year I thought we would do something a little more formal with Eileen. We are going to be reading all the book in the calendar and sharing the activities we do for each book. My goal is to do this every Saturday or Sunday but we will see how that schedule goes. We are starting a bit behind the eight ball. We didn’t register until February so we missed January (we will try and make those books up later). It took a few weeks for the February books to come in so we will work on collecting our books earlier but hopefully we are on a roll now. 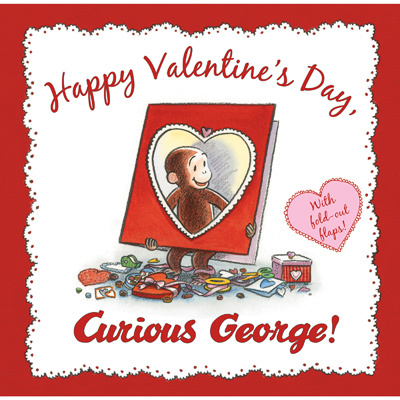 Our first book was Happy Valentine Day, Curious George by N. Di Angelo. I realize Valentines Day had already passed but I thought we could read the book anyway. This is a very cute Valentines Day book, with fold out flaps. For us that means we keep it well out of Michael’s reach! For teachable moments, the flaps give a great opportunity for making predictions. In the story George and the man in the yellow had invite the neighbourhood over for Valentines Day. They decorate the house, make cookies, and make valentines to exchange. Like many children George finds a box and is immediate intrigued with the box. He set to decorating the box to put his valentines in. This would have been a perfect book to read before Valentines Day and then we could make a box for our Valentines, but I wasn’t going to let that stop us. 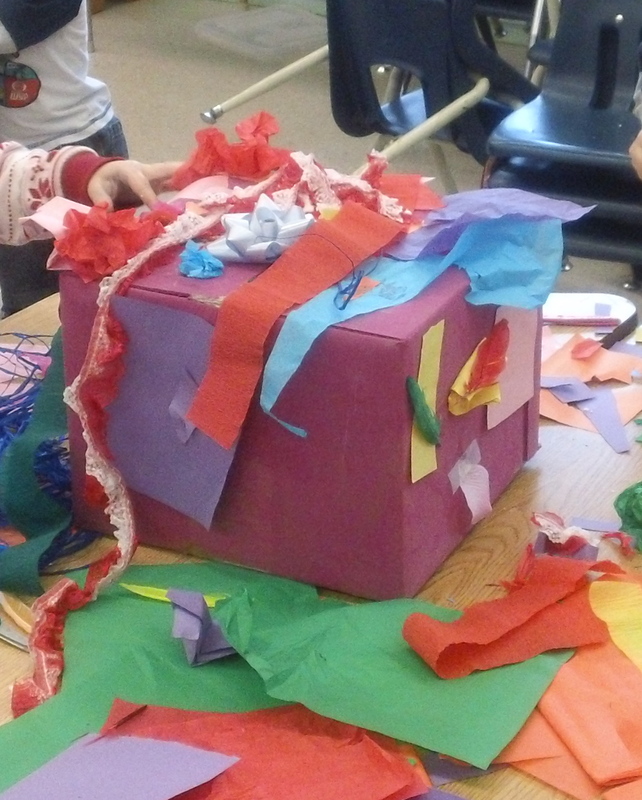 Instead we made our own special treasure boxes. I had my niece and Eileen for the afternoon last Sunday while Kaitlyn was at a birthday party so I thought it would be the perfect time. We went to the dollar store to find boxes. I didn’t want to use cardboard so that they would be more sturdy and last longer but you could easily use cardboard boxes. I also let them each get a package of letter stickers. I wanted them to practice spelling their names on their boxes but other than that they could decorate them any way they wanted. First I let them paint the box any colour they wanted. Of course they both picked pink. I didn’t have any pink paint but that never stops us – we learned that when you mix red and white together you get pink. 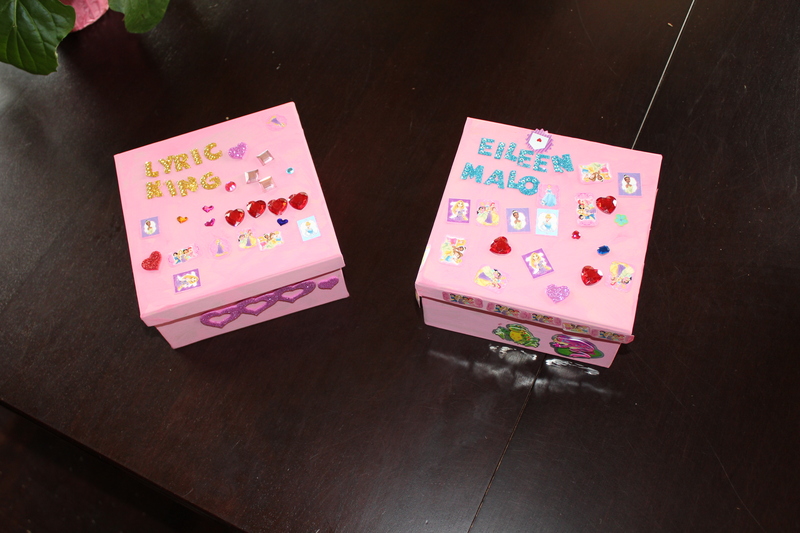 After drying Gramma had come by so she helped the girls spell their names on their boxes. 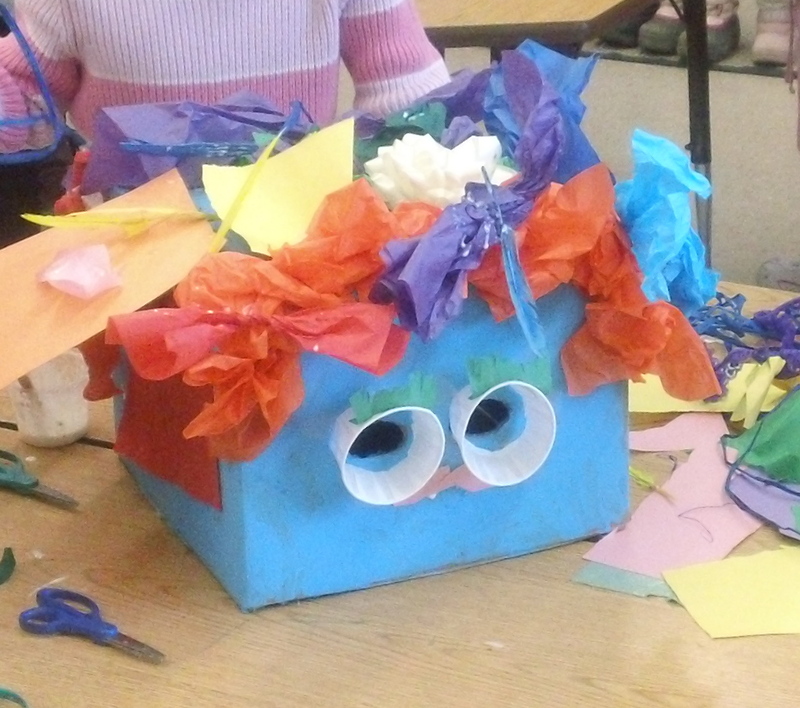 Then I gave them a wide variety of materials from our craft bins to decorate their boxes. They mostly picked hearts, jewels and stickers to decorate. Many stuck on themselves but a few needed to be glued. They turned out pretty cute – and we could make a connection to the book we had just read. We decorated boxes just like George! This was my first Kindergarten unit I pretty much developed on my own. I was so excited to do it and had been looking forward to it since we had our own Chinese New Year celebration at home last year. 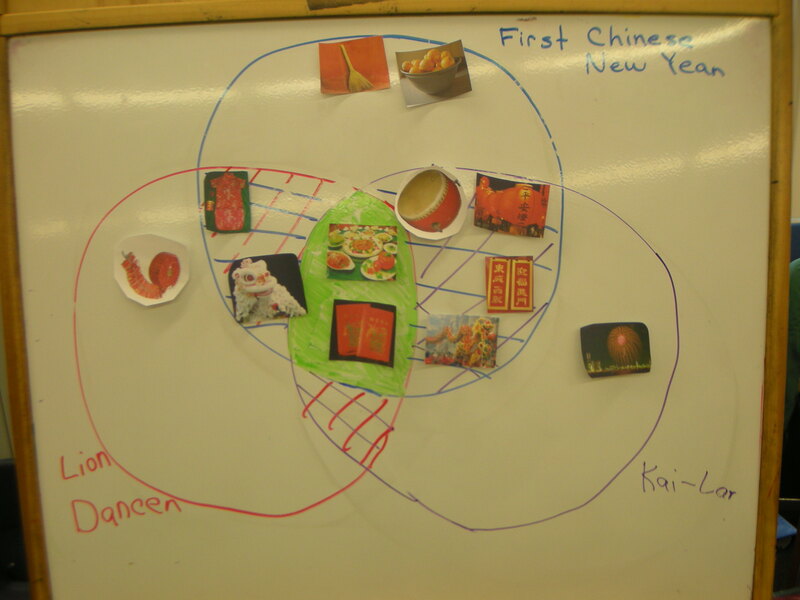 We did this unit from the time we got back to school after the Christmas break and culminated at our Chinese New Year party on January 23rd, it was a total of 4 classes. I had a number of picture books we used throughout the unit. 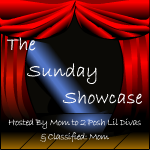 Book – Lion Dancer by Kate Waters. This may seem like a strange book to start the unit with but I had a method to my madness. Our biggest creation was going to be our own Chinese Lion costumes and we were going to make our own dance and musical instruments. 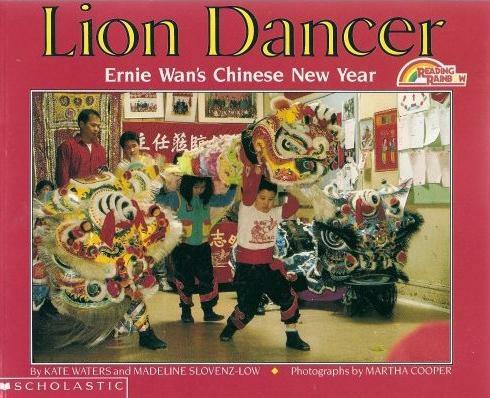 This was a great book to introduce the Lion Dance. After reading we made a list of all the Chinese customs in the book. After reading the book we watched a few youtube clips of lion dancing. 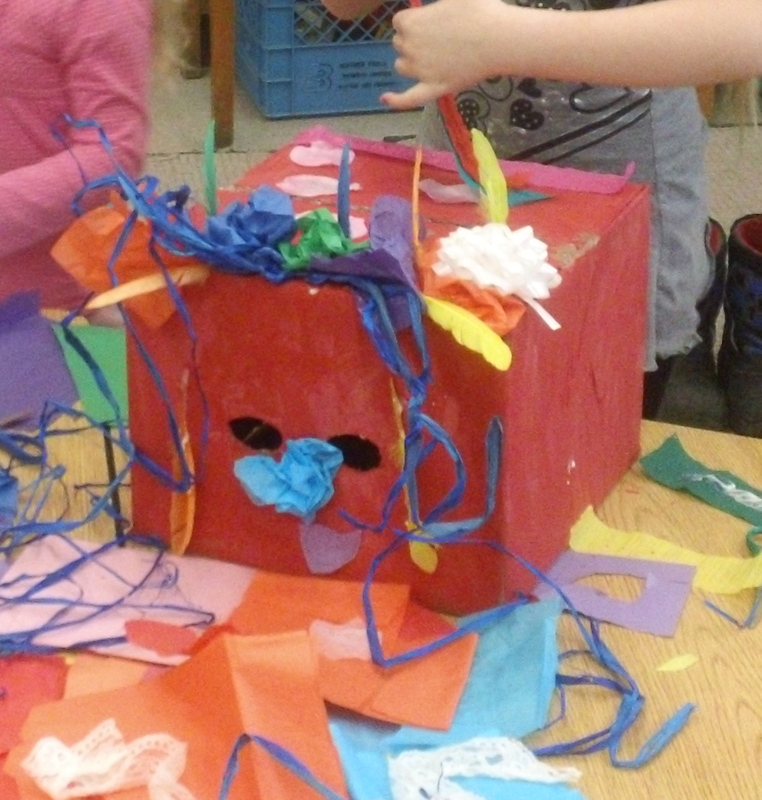 Each group was going to make their own lion head. On this first day all they did was paint a base colour for their box. The key for success is finding the perfect size box. I happen to find 4 boxes all the same size that were perfect to fit over a 4/5 year old’s head. My EA had pre-cut eye holes in each box so the kids didn’t have to worry about that. We also learned our “Lion Dance Song” and made up or own clapping pattern for our dance. Before we left for the day we added Chinese New Year to our calendar and found China on our map of the world. 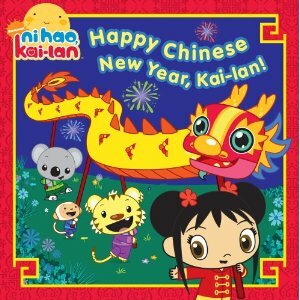 Book: Happy Chinese New Year, Kai-lan by Lauryn Silverhardt. I am always hesitant using book based on shows the kids watch because sometimes the writing is forced but this book was pretty good – and had lots of great Chinese traditions. I also tied in nicely to our Character Ed trait of Responsibility that we were learning about in January. After reading this book we watched a few clips on youtube and compared the Chinese Lion and Dragon dances. They are very different but both very important in Chinese culture. We finished our Lion Head costumes this day and I attached a red strip of fabric to each for the tails. Basically all I did was give them as many craft materials that I could find and let them explore. For some reason I am missing a number of my pictures but when I find better pictures I will add them in. We started working on our dance, which was pretty much just a marching pattern to match the clapping pattern we had created. Now we added instruments instead of clapping. We used small hand drums and small cymbals. For fun the kids made Chinese spin drums using old CDs we painted red, doweling, string and wooden beads. 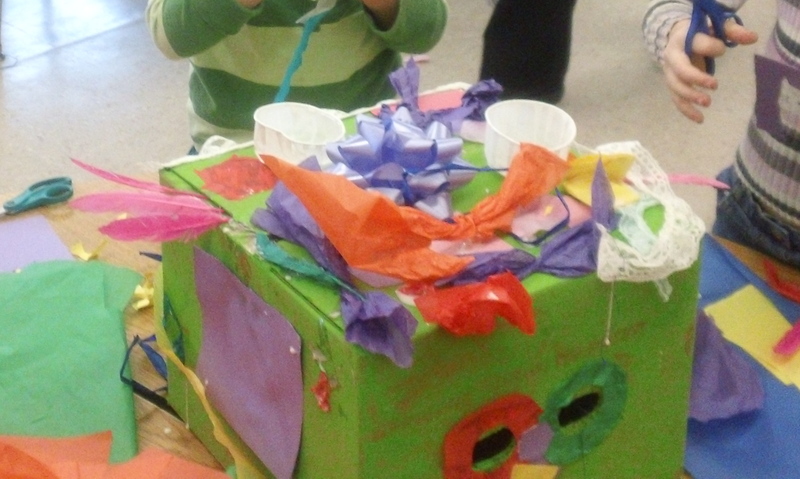 We didn’t use them in our dance as it would have been chaos but it was fun for the kids to make and take home. 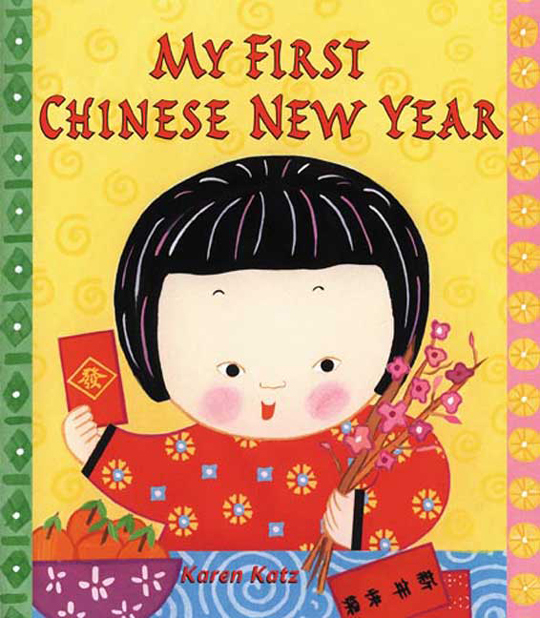 Book: My First Chinese New Year by Karen Katz. This is a very simple book but great at showing the variety of Chinese traditions around Chinese New Year. Again we made a list while reading the book. After reading the book we made a Venn Diagram (with pictures) comparing the traditions in each of the tree books we had read. It was a crude drawing but showed how special food and red envelopes were in all the books. From here I suggested that maybe we could use some of these common traditions to hold our own Chinese New Year celebration. 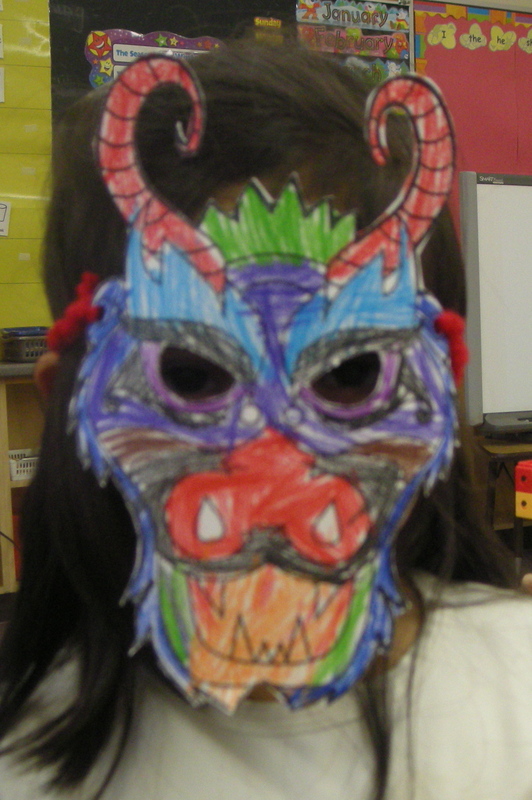 To finish off our day we integrated our patterning studies in math into our Chinese New Year studies. 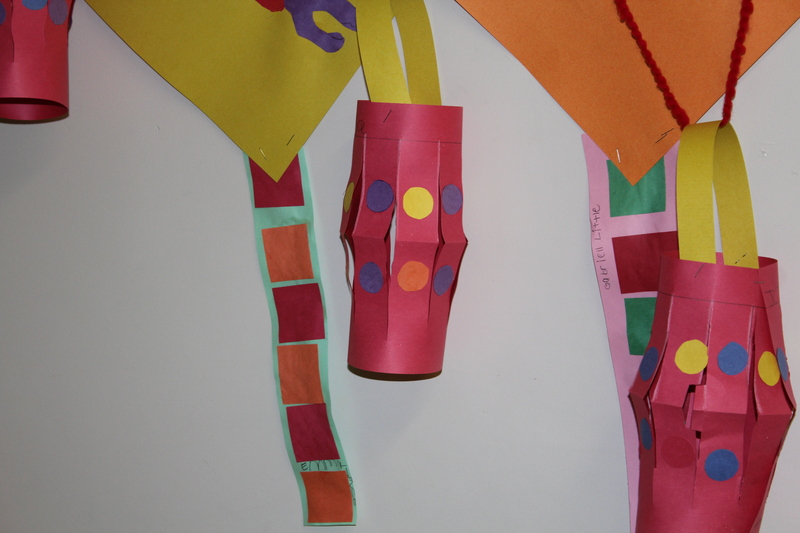 In math we created patterns on strips of paper that were to be used as tails for kites. At the end of the day our Big Buddies came to visit an helped us make dragons on diamond paper for our kites. We used our handprints for the body, cut out the head and then got creative with the decorations. Day 4: Chinese New Year!! 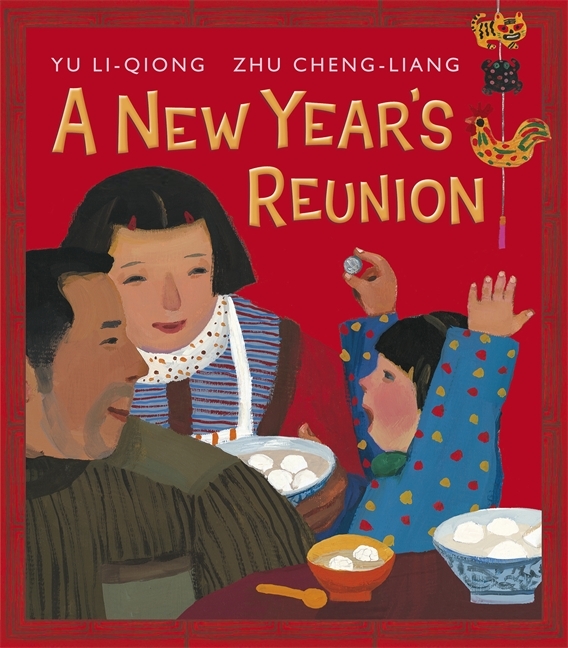 Book: A New Year’s Reunion by Yu Li-Qiong. This is an awesome new book. It was great for retell as we told what happened on each day of the new year celebration. We also did a text-to-text connection picture where they made a connection between this book and one of the three previous books we read. During math we made Chinese lanterns and decorated them with patterns using different colours and shapes. During the last block we had our party. Most of the party was spent eating. We order Won Ton Soup, Sweet and Sour Chicken Balls and Vegetable Lo Mein from our local chinese food restaurant. We bought small egg rolls at the grocery store and I made sticky balls for desert. I was so proud that everyone tried everything and I didn’t hear any complaints. After eating any students that wanted make dragon masks. To summarize everything we learned on Chinese New Year every student completed a glyph. I found a colouring page of a dragon and simplified it for our use. You can find the instructions for the glyph dragon glyphs. I know I took pictures of the bulletin board with the glyphs and when I find it I will add them to this blog.